Ten Years Since the Financial Crash: What Price Education? Graduates in England have the highest student debt in the developed world. So what?! The government line is that “A university degree boosts lifetime income by between £170,000 and £250,000”. Tell that to the mounting number of graduates in the UK who are doing jobs that do not require a degree. (Estimates vary between 23% and 50%.) Just before the A level results came out Jo Johnson, Minister for universities, declared: “We have a student finance system that works”. This was just after a report by the Institute of Fiscal Studies concluded that three-quarters of UK university leavers will never earn enough to pay off their student loans, even if they are still contributing in their 50s. Ever since the post-war principle of free education was abandoned in 1998 by Blair’s New Labour government, fees for higher education have risen steeply and expanded to include maintenance charges. In September new students, and many existing students, will be charged £9,250 for tuition. That’s not the end of it. Anyone whose family cannot support them, or who wants some independence from their family, is obliged to take out a maintenance loan. Unsurprisingly, poorer students are running up bigger maintenance loans, and end up with above average total debts of up to £57,000. Meanwhile, by graduation day the ‘average student’ will have accrued £50,800 of debt, around £5,000 of it in interest. Yes, interest. Student loan interest rates, originally very low, are now set at 3% plus the official rate of retail price inflation (RPI). From September students will face an interest charge of 6.1%, not a negligible rate. So it may be a surprise to learn from Andy Haldane, chief economist at the Bank of England, that interest rates are currently the lowest they’ve been for 5,000 years. Andy is currently getting out and about to meet up with ‘the public’ in a series of meetings from curry houses to schools and town halls. His aim is to “restore trust” in the Bank of England and in economists (he is an economics graduate from Sheffield University) – a trust he appreciates was lost during the international banking collapse that started a decade or so ago. A year later, after a series of bank collapses in the United States and the collapse of Iceland’s three biggest banks, the UK government bailed out the big banks here to prevent the whole economy going down. Since then the onus has been on the rich world’s central banks to “kick start” economic growth. So we have the jiggery pokery known as ‘quantitative easing’ that central banks have resorted to over the last decade. Essentially this means they concoct new money to give to the banks in exchange for taking “non-performing loans” and other dodgy assets from their balance sheets. (The world’s six largest central banks now own a nominal $15 trillion worth of what should be hugely devalued assets.) The banks in turn pretend that they are simply buying and selling bonds but the money capital they are using is fictitious. The nominal values they represent only hold up so long as there is confidence in the currencies they are traded in and the central banks behind them. The give away is that the rate of interest that the banks are charging to lend to each other is 0 to 1 per cent! (The US Federal Reserve is trying to lead the way out of QE and over the past year has upped interest rates to 1%.) They are in a Catch 22 situation. Although ‘monetary easing’ has so far prevented the system’s complete collapse, more companies than ever belong to what the OECD calls the group of “walking dead zombie firms”. These are businesses whose profits hardly cover the interest due on money they’ve borrowed. (10.5% of companies in the world’s thirteen most advanced economies are zombies, compared to 6% a decade ago.) Clearly such companies will go under if the central banks suddenly push up interest rates to more ‘normal’ levels. On the other hand, the longer they keep interest rates around zero, the more capital is ready to exist by borrowing and the more the debts pile up. This is the phantasmagoric financial world the Bank of England’s chief economist inhabits, the world where interest rates have never been lower. Anyone with a savings account can see it. But when it comes to personal loans in day-to-day life there is one law for banking/financial capital, and another for the rest of us. How many students, for example, can borrow money at 0 per cent interest!? In the decade since the financial crash tuition fees alone have gone up from £3,000 to more than £9,000. During the same period annual inflation has averaged around 3 per cent. If tuition loans had gone up “in line with inflation” they would now be around £4,000. This means the real cost of higher education has more than doubled, and that excludes maintenance and interest on the loans. No wonder many school-leavers are questioning whether it’s all worth it. It’s also not surprising that Jeremy Corbyn’s promise to abolish student loans has won him more support than anything else. But Corbyn cannot solve the crisis of the wider capitalist world. It is a world weighed down by debt as low profit rates limit the scope for productive investment and make financial wheeling and dealing more attractive. For the financiers making money out of money, as with trading in debts, is the same thing as creating real value. In reality, as one Karl Marx pointed out, “all these securities, actually represent nothing but accumulated claims, legal titles, to future production.” So it is with student loans which are automatically paid back from wages, in effect by a higher rate of income tax for graduates. Rich pickings for the finance capitalists who have already got their hands on part of the UK student loan book. But there is more to it than this. The universities themselves have become part of the marketplace, competing with each other to attract more students on whose fees they increasingly depend. (Including lucrative high-paying foreign students whose fees are not capped.) This has fuelled the biggest expansion of universities since the 1960s. New lecture theatres, libraries, laboratories, halls of residence, whole new campuses, are being financed by student fees and the low interest, long-term credit those fees can secure. Perhaps this is what Jo Johnson means when he says the system is working? 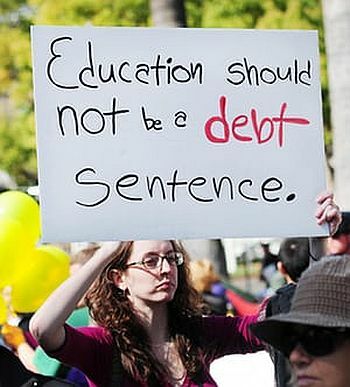 But, like the capitalist system as a whole, the universities’ debts are mounting. As more of their income goes to servicing debt the more precarious their situation. Johnson is already prepared to accept that some smaller institutions will go under. “There may be some providers who do not rise to the challenge, and who therefore need or choose to close some or all of their courses, or to exit the market completely”. But the dilemma is worse than this. The universities as a whole now owe so much money that their balance sheets can easily be tipped into the red: for example, if their income from student fees was reduced. Their own funding body, the HEFCE (Higher Education Funding Council for England), admits that the situation is “unsustainable in the long term”. Corbyn is trying to be a practical politician. He knows he cannot commit to writing off previous students’ debt which now amount to over £100bn. Much of this is locked into UK universities’ web of credit commitments which, if they were reneged on could spark a wider financial crash. As for entirely abolishing the student loan system, at the very least this would pile the universities’ debts and running costs back onto the state’s balance sheet, putting an end to higher education expansion and leaving many more school leavers without paid employment. For would-be reformers of the existing system it highlights their tiny room for manoeuvre. Just look at how Syriza is implementing the austerity measures demanded by Greece’s creditors. If the Corbynistas of the world seriously tried to take on finance capital and abolish the debts, then the whole system would come crashing down even quicker than it inevitably must. If they carry on ‘printing money’, put up corporation tax to finance the NHS, fund university education or embark on “people’s quantitative easing”, then the debt burden will massively increase. Financial capital will run a mile and the threat of Weimar-style inflation will be more likely. Meanwhile growing numbers of university graduates, along with the rest of the working class, are being forced to pay in terms of low paid, precarious jobs and general deterioration in the quality of services and standard of life. There is no quick fix. The only realistic way to overcome the problems of capitalism is to organise and fight to get rid of it, not tinker about with its state mechanisms from within. We need a society without money, without a state and without frontiers where everyone gives according to their ability and each gets according to their need. That’s what we are fighting for. Why not join us! All quotations from Marx are from Capital Volume 3, Penguin classics edition, chapter 30: Money Capital and Real Capital. It would be interesting to see how this really works. A few well connected graduates will go on to earn astronomical figures and a larger group will go on to earn relatively well, but I wonder what is the reality for the graduates of working class origin who have no such backgrounds and who see themselves caught in a sort of no mans land between the dream of the well paid profession and the reality of the proletarian condition into which they were socialised. "More than a third of millennials wish they had skipped university due to the huge debts they have accumulated, a report has found. Around 37 per cent of 18 to 35-year-old graduates said they regretted getting a degree, while 49 per cent believe they would have got to where they are now without it. And despite having had longer to see the benefits of their degree, 25 to 35-year-olds were as likely to say they regretted university due to their debts as those aged between 18 and 24." More than a third of graduates regret going to university, and half reckon they would have landed their current job without having to study for a degree, according to damning research into the finances of the millennial generation. The research by insurance company Aviva was published days before hundreds of thousands of A-level students discover if they have obtained the grades needed for their desired university course. In the report, entitled Generation Regret, Aviva warns that many will wish they had never bothered attending university, given the level of debt they will accumulate. "But, if constructing the future and settling everything for all times are not our affair, it is all the more clear what we have to accomplish at present: I am referring to ruthless criticism of all that exists, ruthless both in the sense of not being afraid of the results it arrives at and in the sense of being just as little afraid of conflict with the powers that be." MarxPerhaps it is worth mentioning here that it is not simply the financial aspect of the educational process which is problematic, it is the content of that education, the conditions in which it is carried out, its purpose which is not always as it appears, ultimately a cog within the wider capitalist machine which has to be put down. The article says as much though, the ICT knows that the crux of the matter is connecting the many grievances to the revolutionary solution.